Our second full day in London got off to a bit of a late start. I think the jet lag finally caught up to us, but we’re on vacation, right? 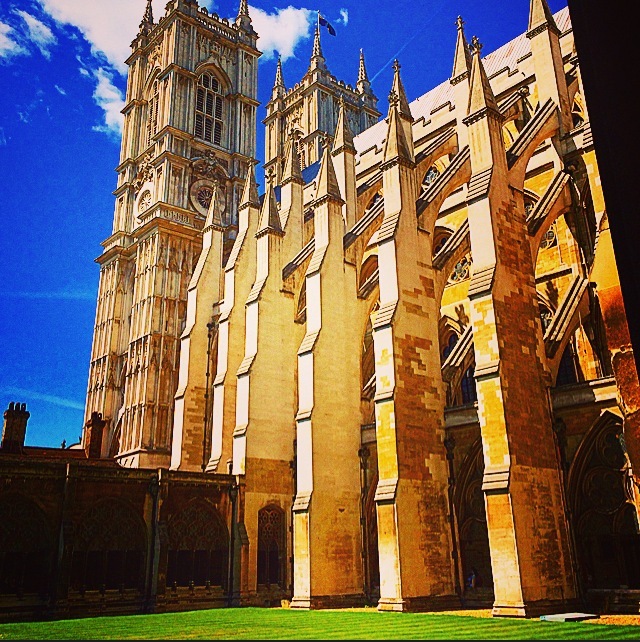 We spent the late morning and early afternoon at Westminster Abbey. I had not been there since I was here during my semester abroad during “university”, that’s what they call “college” here in the UK. Anyway, I’d forgotten how chock-a-block full of history the place is. The tomb of Queen Elizabeth I and Mary I, buried together, was especially interesting. I hadn’t realized they were entombed together, which surprised me because they were so at odds with each other. “Bloody Mary,” devoutly Catholic, ruled prior to Elizabeth, and even had her half-sister imprisoned. Elizabeth steered England back on a Protestant path. And now they are together for eternity. I’m sure there is a message for us all in there. In addition to kings and queens, we saw many tombs of other famous leaders. Oliver Cromwell’s tombstone is intact, however, his body is not. When the monarchy was restored after Oliver Cromwell’s death, they exhumed his body and hung it. Then it was drawn, quartered and decapitated, the head later displayed as a warning to any other would-be rebels. And they say the Brits have a flair for understatement and subtlety. 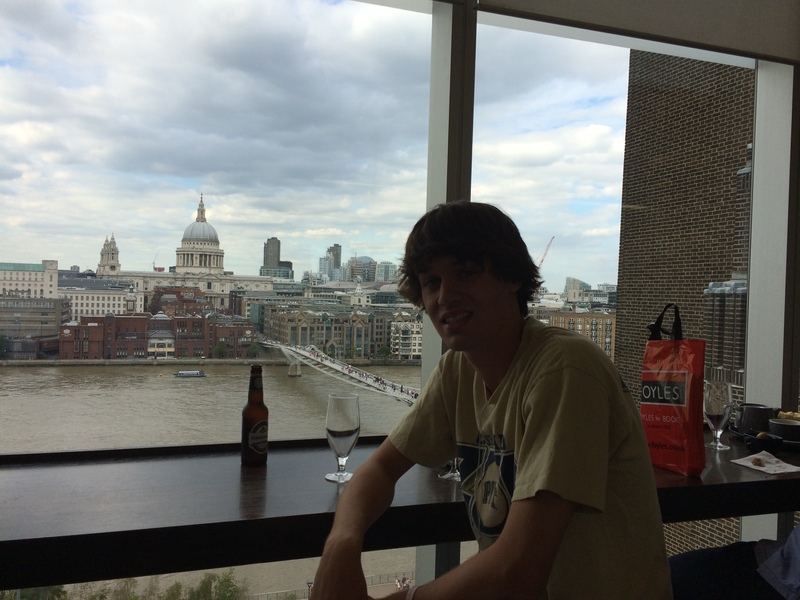 We crossed over the Thames for the rest of the afternoon, visiting the Tate Modern, one of my favorite museums. Housed in a former power station, it’s a great example of reusing old structures in new and inventive ways. 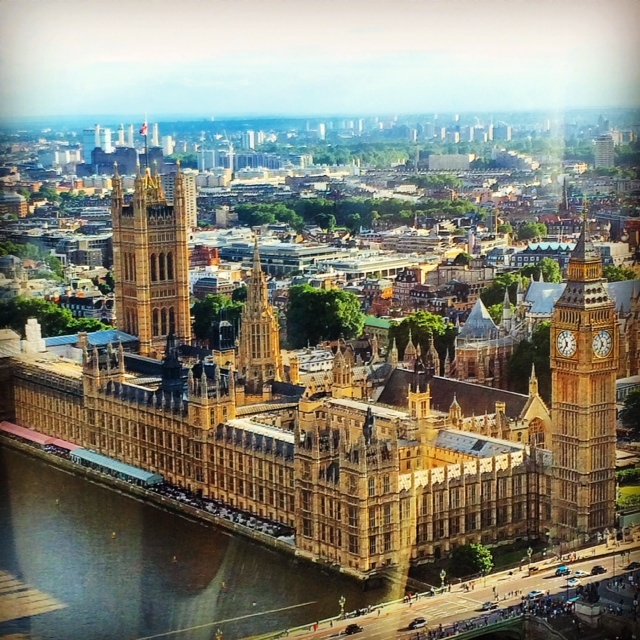 In addition to some great modern art, one is also treated to a spectacular view of the London skyline from the museum’s 3rd and 6th floor cafes. Ian and I felt this was an appropriate place for a break and some light refreshment. 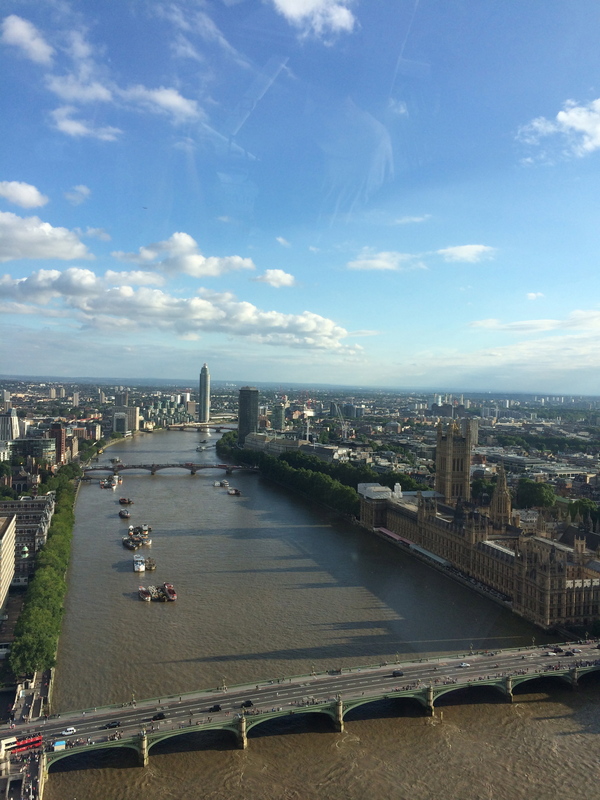 Our itinerary ended with a trip on the London Eye, the ginormous ferris wheel on the southbank. 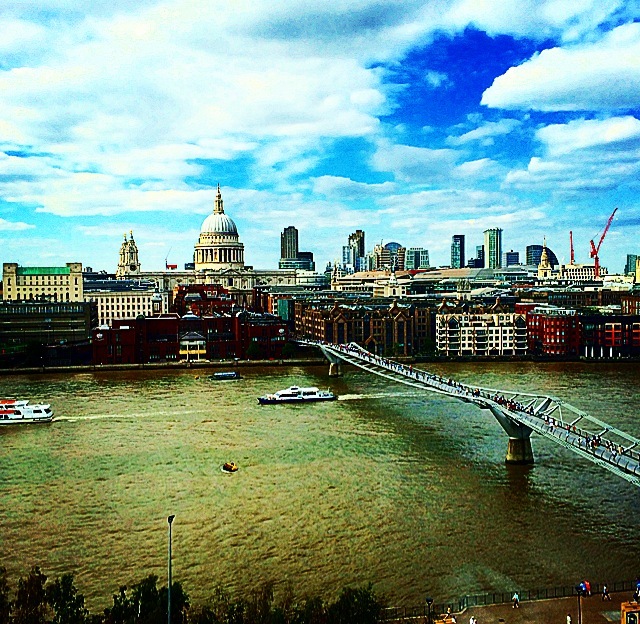 It may be cheesy, but there really is no better view of London anywhere. We were treated to spectacular vistas of the entire city. We returned home by “Tube”, that’s what they call the “subway” in London, and as it is getting steadily warmer, we decided we would pick up a fan (no AC in most apartments, I’m sad to say). Poor Ian spent the next hour trying to put the dang thing together sans proper tools only to realize a key piece was missing. At the same time I discovered that our tour to Bath and Stonehenge that I thought was in two days, was actually the next day. Oops! We decided to “chuck” it, that’s British for “blow it off”, and go out for dinner. 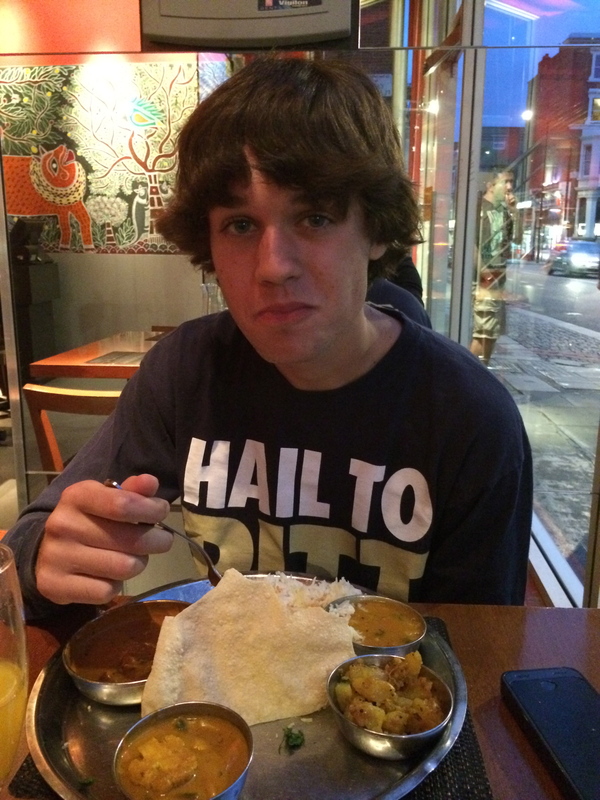 Ian had heard a lot about the Indian food in London, so I consulted the interweb, and found the best restaurant in our neighborhood. Our waiter was more than happy to recommend an assortment of dishes that we should try and I think Ian really enjoyed it. I know I did. We mapped out our plan for the next day over dinner and walked home, feeling pleasantly tired from a great day and a terrific meal. We set our alarms for 6 a.m. (or, at least I did) in order to be at our meeting spot for our Stonehenge tour by 7:30, and drifted off to sleep with visions of druids dancing in our heads. Rico version of the day’s events: Forcing myself out of bed (again) I did not feel ready for the day. But, after a hot, very long shower, I was ready to begin today’s adventure. We met the tube at our local station, Earl’s Court, and took it to Westminster to be greeted by the marvelous Big Ben and Parliament building. 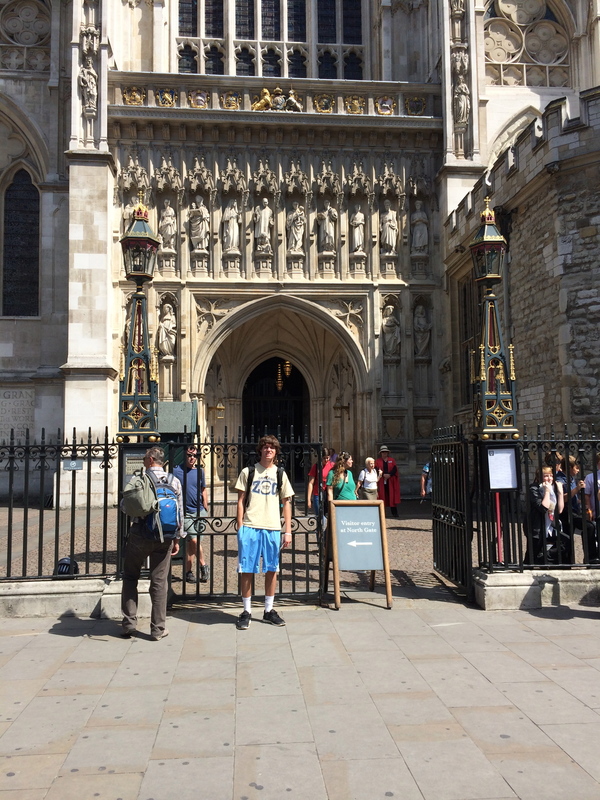 A short walk took us to our first stop of the day, Westminster Abbey. I was amazed by the architecture of the Abbey outside and inside. There were beautiful stained glass windows and gigantic monuments memorializing Britain’s greatest nobility and personalities. An extremely helpful audio tour guided us through the Abbey, where flash photography was forbidden. So many great pictures could have been captured but I was not feeling barbaric enough to dare. We then journeyed across the Southwark Bridge to the Tate Modern. As most of you know art is not my forté. In spite of that, I enjoyed the Tate a lot, but, like Jane mentioned, the 6th floor café was amazing and provides a view unlike any other. 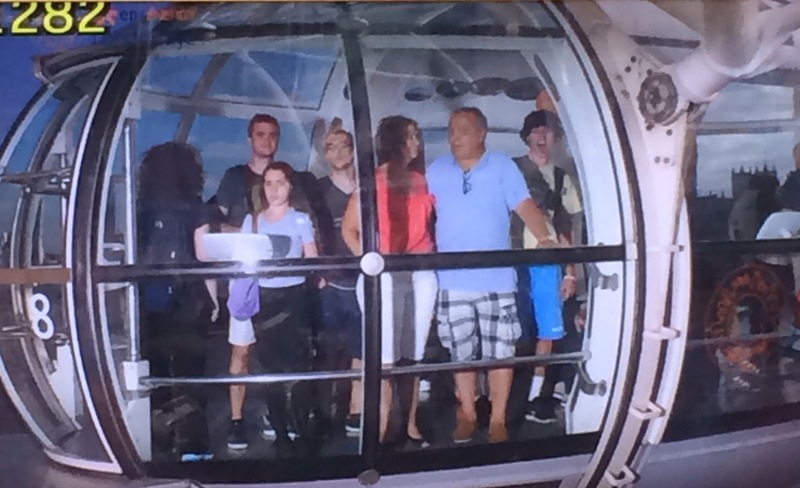 After a delicious brew we headed for the famous London Eye. Aunt Jane was clearly on her game as we got to fast trak ourselves to the front of the line. Another spectacular view, I captured some of my best photos (see below). We headed back to our apartment after, but first a quick stop at the local Robert Dyas to pick up a fan for my room. We did not have our thinking caps on during the purchase of the fan because a Phillips head screwdriver was necessary for proper installation of the fan and after coming home did we realize there weren’t any in sight. This made me quite angry because why are there no screwdrivers in the apartment? There is an electric rice steamer but no screwdriver? Guess who decided to photo bomb the Eye’s robo-photo? Can you spot Rico? P.S. For those of you who may be texting Aunt Jane and wondering why you’re not getting a response, her iPhone was stolen last night, but you’ll have to wait for that post get the whole story. Sounds like you are having a great time…can’t wait to hear about the iphone incident. keep the messages coming! ← and it’s great to be in Britain, too.